The Canon EOS M5 is a camera released in 2016. This camera is intended for photographers who want a lighter DSLR camera, especially because this mirrorless camera has a viewfinder on top. So, it’s nicknamed as mini DSLR camera. In addition, this mirrorless also has a lever and the camera button that are quite numerous and complete. Then, How about the feature? When first appeared, this camera attracted a lot of attention. As mentioned above, this camera is like a mini DSLR, especially because this one mirroless has a viewfinder. The Canon EOS M5 has a viewfinder or electronic viewfinder (EVF) with OLED technology that has a high resolution of 2.36 million points. Of course this is very useful for those of you who are able to use a DSLR. The viewfinder can provide a clear image display. The picture produced by viewfinder has same color as the original picture’s taken. Moreover, photographer can move the focus point, especially when using viewfinder, by touching and moving their finger on LCD screen. The EOS M5 is equipped with an LCD screen that can be flipped up or down. This screen can rotate at 85 degrees to 180 degrees. So taking selfies, pictures, or making vlogs with this camera can certainly not be a problem. This 3.2-inch LCD screen is very detailed because the resolution reaches 1.6 million points. This relatively large LCD screen is also equipped with touchscreen technology, which can be used to change settings, menus, focus areas and photos. Meanwhile the EVF viewfinder is classified as standard. That is with a resolution of 2.3 million points with an OLED panel. The first feature that we will speak up is the sensor. Canon EOS M5 is equipped with sensors that has Dual pixel technology. Usually this sensor is on a semi-pro DSLR camera such as 70D and 80D when live view. Canon EOS M5 is also awarded predictive AF technology. This technology makes it easier when photographing a moving subject. The autofocus is also able to track and lock focus on the subject quickly. Autofocus speed is very good for stationary subjects. However, for fast moving subjects, the autofocus is still lacking. The fast autofocus performance is also supported by the ability to take pictures. This camera is capable of shooting nonstop up to 7fps. With focus that keeps on chasing or up to 9fps in the locked focus position. The Next Feature is Wi-Fi. When shooting with the Canon EOS M5 you can immediately share the results of photos taken to social media without the need for PC or laptop assistance. The Canon EOS M5 is equipped with Bluetooth connectivity and can be connected to a smartphone via a Wi-Fi and NFC connection. Once connected, users can send images and videos to these devices and upload them to Canon Image Gateway, social media networks, or cloud storage services. Canon EOS M5 has a physical button. All the buttons are very easy to access, including four functions on the side of the screen. The size is also quite large and feels comfortable when pressed. In addition, this camera has a grip that is large enough that this camera is very comfortable when it’s used. The EOS M5 is also relatively light and compact so it’s still ideal to be your holiday friend. The image quality of the Canon EOS M5 is equivalent to that of Canon generations of 2015-2017. This 24MP sensor was first encountered on the Canon 750 / 760D, then on the Canon 80D. The image quality is above the Canon EOS M1, M2, and M10. The 24MP APS-C sensor which has a 1.6X crop factor is good enough to be used at ISO 100-1600, at ISO 3200 the details start to decrease but are still acceptable, ISO 3200 upward should be used if needed. Canon EOS M lens collections are far less than Canon EF / EF-S lenses for DSLRs. But fortunately, there is a Canon EF-EOS-M adapter that allows EOS M5 users to use Canon DSLR cameras if they have them. This camera is suitable for those of you who like selfies or making videos. It can produce good quality. In addition this camera has facilities such as mic-port, digital & optical stabilization. This camera is also classified as a lightweight camera. So it’s easy to travel. This series is also easy to operate, especially the touch screen. It should also be known, that a lens from Canon that has not been previously owned can be used in this camera with additional adapters. 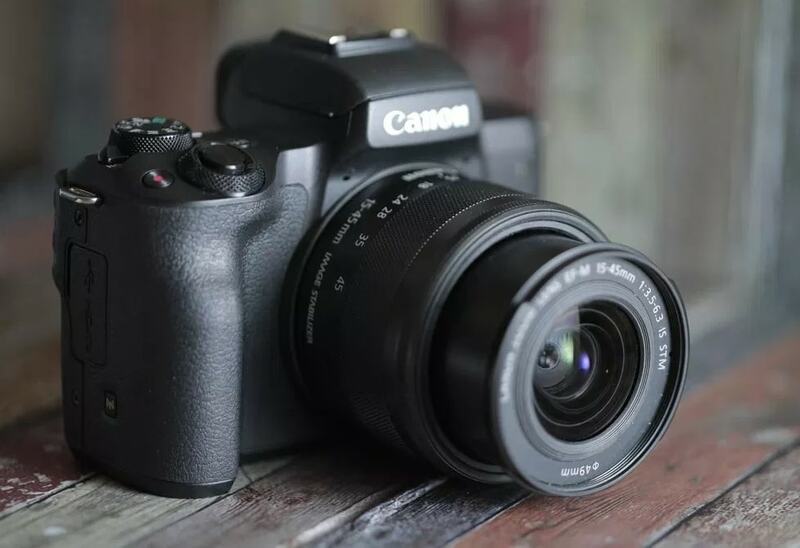 So, for those of you who have previously used a Canon DSLR camera but want to switch to a mirrorless camera or use a mirrorless camera as a backup camera, Canon EOS M5 can be a recommendation.